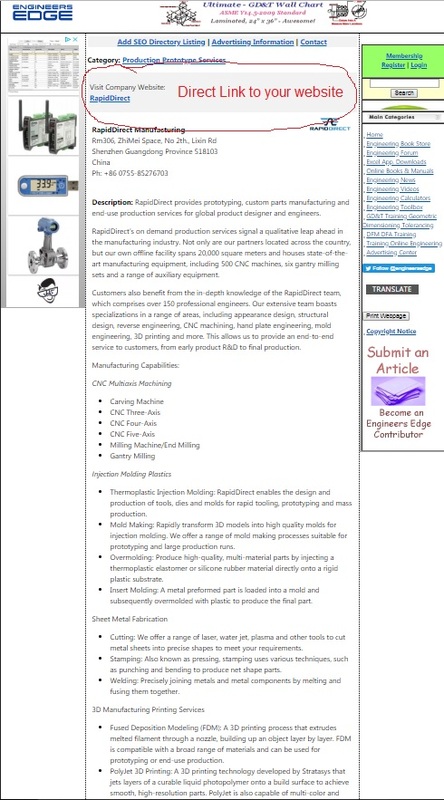 Engineers Edge is a premier portal for design, engineering and manufacturing professionals worldwide. Engineers Edge provides you with high-value targeted advertising opportunities. Visitors on Engineers Edge are "not just surfing", they're purchase enabled experienced professionals with a specific purpose in mind, they're looking for solutions to problems. Add your site to EngineersEdge.com Directory within the category that best matches your product or service. Your listing will be available to all visitors and included within engineersedge.com and internet search results. Engineers Edge staff will assist your copy to ensure optimal keywords are in use. Listings run one calendar year for $150. Listings are live within one business week.Your company name included within Engineers Edge search results. Hundreds of categories available to ensure you get placed within the most correct location.